If you want to remain fashionable, drop those stock laptop bags and pick up one of Abbi New York’s designer laptop bags. 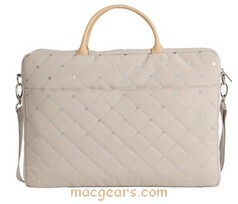 My personal favorite is the Sequins Mina range; a classic slim working bag. Just like a woman, the Mina is of refined beauty which is made of quilted sequins and has an adjustable strap for comfortable shoulder rest. The Mina slim working bag can fit 17″ screen display laptops. The bag has exterior pockets where you can store accessories that requires easy access. The Mina bag comes in a choice of ivory and black colors and is priced at $79.95. More information and purchase details can be obtained from Abbi New York’s web site. Avid bikers are going to love this hardpack — Axio not only designed this hardpack with aerodynamics in mind, it also combined an aggressive outlook with modern functionality. Although the top of the pack is hard, the back of it is soft and ergonomically built for comfort. The interior storage space boasts of a size of over 1200 cubic inches which has multiple compartments to store your BlackBerry, iPod, the newly unveiled iPhone and other devices. 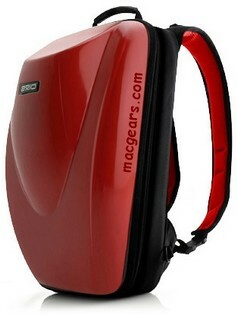 The main compartment should fit your MacBook, MacBook Pro, iBook and PowerBook easily up to the 17″ model. However, take a quick peek at Axio’s Swift hardpack dimensions to be absolutely sure. The Axio Swift Hardpack has a suggested retail price of $134.95 (Amazon’s price is $118.00 ) and is available in Gloss Red, Electric Blue, Carbon Finish and Metallic Gray colors. Owning a MacBook Pro is probably one of your best decisions. Your Apple MacBook Pro will provide you years of quality service and will function as you intended – only when you take care of it. One of the ways of caring for your MacBook Pro is to put a layer of protective cover over the keyboard. Having this layer of protection, it will ensure that food, staples, dirt and other materials do not lodge between the keys. At the same time, water and other liquid are kept at bay, ensuring that your MacBook Pro does not experience a short circuit. This keyboard protection by Macessity leaves the key visible; soft and smooth to human touch and is washable. Get your Keyboard Protector from Amazon for only $12.99. Notice how most of Apple products are finished with white gloss? Isn’t it all too common for one to assume that white represents Apple products? Do you own a white Apple product or gadget and the color white is getting stale to you? Are you look for a change? Do you fancy a change? 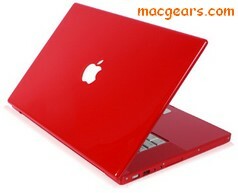 Differentiate yourself and your Apple products now with services from ColorWare. Starting from a fee of $64, right up to $449, you can transform your Apple products into attention grabbers. With a tag line like “We will continue to create and transform our products beyond what the original manufacturers intended“, rest assured that ColorWare will transform the ubiquitous beige computers into custom-colored works of art. One look at Zegari’s laptop bag and you will be amazed how beautiful it looks even though Zegari has modestly put it as a minimalist design. Befitting its status as a designer laptop bag, Zegari claims that this beauty is made of the finest leather with eye-catching materials (I believe them). Forget about sleeve protectors, forget about laptop backpacks and say hello to a laptop bag that was designed with anti back-breaking ideas in mind. The Zegari laptop bag protects its precious contents with foam and structural protection which is evident when you look at its sturdiness. Inside, you will discover numerous pockets and organizational holders for your mobile phone, PDA, iPod, pens, call cards and paper documents. On the outside, you get zipped pocket for you to keep easy access documents such as airline boarding passes and train tickets. While you can opt to carry the Zegari laptop bag on it’s soft cushioned leather handles, you have the option to sling it on your shoulders with a leather strap that comes with the bag. This laptop should fits most laptops with 15″ screens (if you intend to purchase this bag, it is best that you contact Zegari’s customer service to ascertain if your iBook, PowerBook or MacBook fits; for the price is not cheap). The Zegari laptop bag does not come cheap; it is priced at $285 but wherever you go, this ‘minimalist’ bag is going to make heads turn. For more information, visit them at www.zegari.com.